Thanks to a stunning breakthrough, it will now be possible for the deafblind to communicate online and without interpreters. Until now, they could only communicate in person using hand gestures. 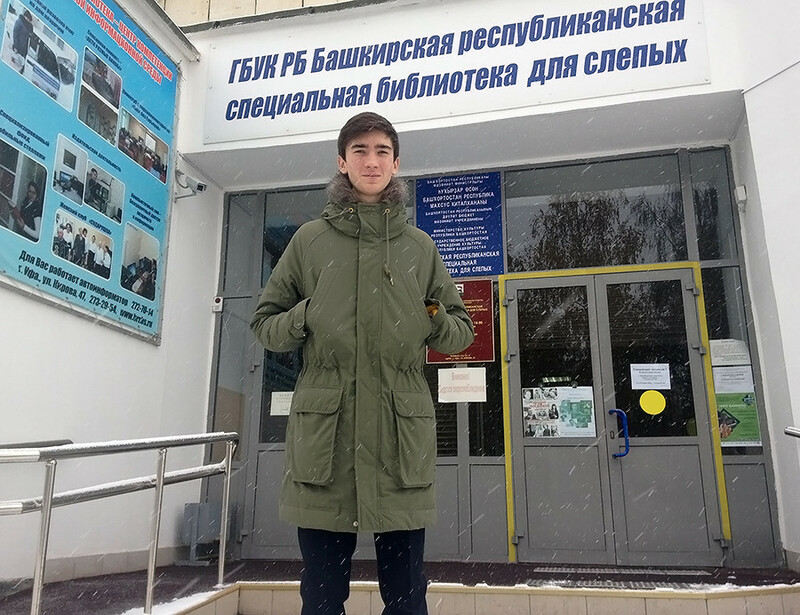 Artur Shaykhatarov, 17, from Ufa (720 miles from Moscow) has been into computer programming since his early teens, but the project that has made him famous is not IT-related. His new application helps those with hearing- and vision-impairment to communicate using Morse code. Messages are sent by tapping text on a smartphone screen, encoded into Morse and then received by a deafblind person through vibration on a smart watch. A few years ago, Artur became acquainted with a girl, Alena, who has been deafblind since she was six. Alena’s story made Artur want to help deafblind people communicate. The movie has an episode where important information is transmitted back to Earth from a black hole by using Morse code. After seeing this film I came up with the idea of creating a mobile app for deaf people,” Artur said. 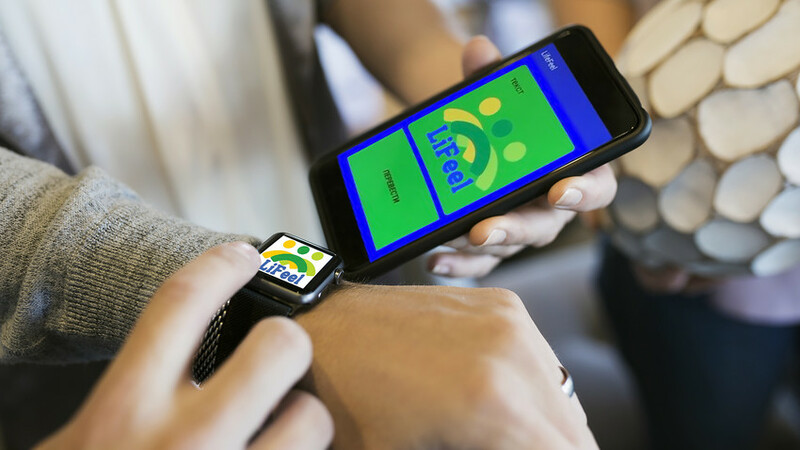 With his project, “LifeFeel” Artur won a local Ufa contest backed by the Bashkirian Academy of Sciences, but the breakthrough came about when he became one of 10 recipients of a state-funded grant that gives winners 500,000 ruble ($9,000). Recipients are obliged to use the money for the benefit of their projects over the course of two years. Artur’s work has been recognized with a certificate by Russia’s Labour and Social Affairs Ministry. Arriving in Moscow from Ufa to receive the honour, Artur also had an important meeting with a group of people who are hearing- and vision-impaired. The gathering was organized by “Connection,” a Russian deaf and blind support foundation patroned by important Russian governmental and business figures. 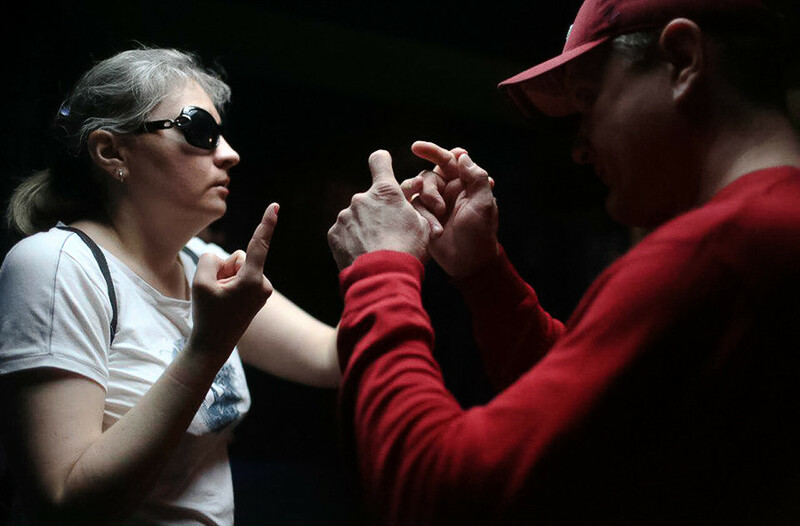 Deafblind people Lyubov Zhukova and Ruslan Kuleshov are seen communicating using fingerspelling. Artur said there is a German-produced Braille display that can transmit information long-distance, but it is bulky, only works near a computer and costs from $2,700 to $8,000, which is clearly unaffordable for most deafblind people. The system that Artur developed costs considerably less – it consists of a smart watch and a smartphone. To use, a deafblind person must first learn Morse code, but input can be performed in any language, and the system needs no interpreter. Most important, a word is transmitted in only 40 seconds! “I plan to use the grant to improve my invention. I’ll hire professional developers and programmers, pay for tests and research. I need certain equipment and an opportunity to organize frequent meetings with deafblind people,” Artur said. Artur already has many offers for both study and work in Russia, the U.S. and Europe, and he said he’s currently studying his options. Still, he doesn’t intend to profit directly from his invention. “I’m planning to make this an act of charity and to give away the software and smart watches to deafblind people totally free of charge. My main goal is to help deafblind people get employed, therefore, I plan to develop partnerships with the companies that will employ them,” he explained. Artur’s computer science teacher, Chulpan Nafikova, says (link in Russian) that the young scientist has been experimenting with Morse code for a couple of years. “He created a program that was not big, but very complicated for a boy his age. This program coded and transformed information using Morse code. So later he developed this idea to create his new app,” Nafikova said. For more about Russian science, check out the greatest Russian scientific feats or get to know 4 emigrant Russian geniuses.